In May, the Queen Mum was crowned. If you missed the news, you may have been out of town, like Beverley Christensen was when she was voted Queen Mum for the BC Hoover Hatters, a chapter of the Red Hat Society. Christensen, 69, might be seen around town donning her purple clothes and red hat once a month with some of the other 25 ladies in the BC Hoover Hatters chapter, but her crown is one that is intangible. While some refer to her as Queen Mum, others refer to her as an angel. “I was a mortgage banker for 15 years and an escrow officer for 20 years. I also had my own cleaning company for a few years. I no longer have my cleaning business. I do cleaning for friends that need help,” she said. Christensen also helps other members of our community in a variety of ways when there are times of need. She said she helps take care of some neighbors that aren’t getting around as well as they used to. She has been there for younger people, too, taking special outings, having quiet talks and giving parents just a little extra hand. She arrived in Boulder City 25 years ago with her dog, Jake, towing her car behind a loaded truck. When she ventured out, she found her way to Shannon’s, which is now Evan’s, and was immediately befriended by Big John Mayo, who gave her the ins and outs of Boulder City and a lasting friendship. As far a blood relatives go, her one son, JD Morgan, has a family and lives in Austin, Texas. She’s looking forward to traveling to see them during the holidays. Her babies now are her two dogs, Smootzie and Mia. Then there is her younger sister, Barbara Yeager, of California. Although she said she didn’t get to pick her sister, if she had the opportunity she would have chosen Barbara. “She is the best person I know! We travel great together,” Christensen said. Yeager is a retired flight attendant and Christensen is her “forever buddy pass.” The sisters have traveled across the world together, staying in bed and breakfast inns and doing what the locals do. “We have been to places like Ireland, Africa, England, basically all over Europe. Belgium was my favorite,” she said. When Christensen was 67 years old, just six months after open heart surgery, the sisters walked the Great Wall of China. She said this is one of her proudest moments. During her many travels, Christensen gathered new additions for her cookbook collection. 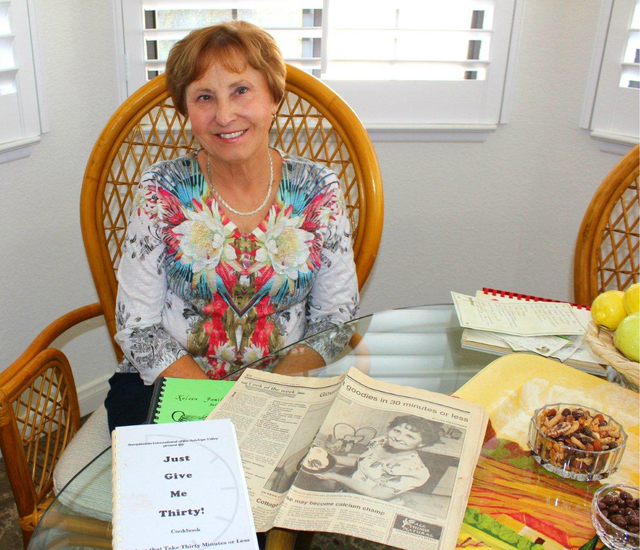 While living in California, she was a member of the Soroptimists International of Antelope Valley, which raised money for kids and families. She laughed as she explained and shared the large article written by the local paper that helped promote the book. If you are interested in being a guest for one of the monthly get togethers of the BC Hoover Hatters, Christensen said to all her at 702-526-4668. Combine first five ingredients. Make dressing. Toss and then sprinkle with peanuts. Combine oil, sugar, salt, mustard and onion in blender on high speed. Slowly add vinegar. Beat until smooth and thick. Add celery seed. Serve with salad made from butter lettuce, mandarin oranges, walnuts, red onion.